Venado Tuerto, Argentina - In the continuation of the visit to Argentina as the Bishop - administrator of the newly-founded Diocese of Buenos-Aires and South-Central America of the Serbian Patriarchate, His Eminence Archbishop of Cetinje and Metropolitan of Montenegro and the Littoral Amfiilohije served, on the occasion of the church slava, on November 21, 2011 on the feast day of St. Archangel Michael, in the church in Venado Tuerto in Argentinian province of Santa Fe. 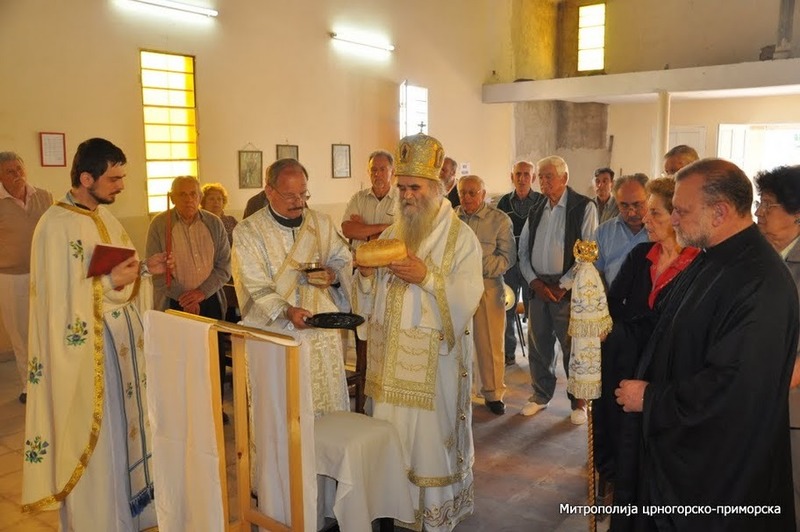 He was concelebrated by presbyter Bosko Stojanovic, parish of Buenos Aires, protodeacon Nikola Radis from Buenos Aires and deacon Igor Balaban with the participation of believers who mainly originate from Montenegro. The Holy Liturgy was attended also by priest Alexandro Saba from the Patriarchate of Antioch. Following the service and after believers partook the Holy Communion, Metropolitan blessed the slava cake on the occasion of church and his family slava, and shared small icons of St. Basil of Ostrog and St. Peter of Cetinje as well as small crosses to believers. The same day afternoon, Metropolitan met with His Eminence Siluan, Archbishop of Buenos Aires and All Argentina of the Patriarchate of Antioch.